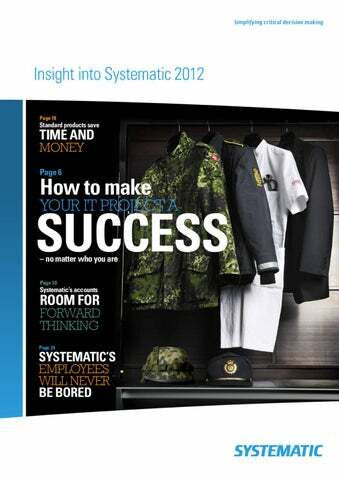 Insight into Systematic 2012 Publisher: Systematic A/S © Systematic A/S. All rights reserved. This magazine is updated in January 2012. Most of the factual information relates to the financial year 2010/2011 (1 October 2010 – 30 September 2011). Systematic’s actual annual report for 2010/11 is presented in a separate publication that is available on request, or in electronic format as a download from www.systematic.com. Page 14 How can we help you? This printed matter is marked with the The Nordic Eco Label 111-111.
d­ eath. So another trait shared by our customers is that they place very high demands on their IT solutions. Over and above high quality, our customers expect to receive their IT solutions on time and at the agreed price. Consequently, our customers belong to the ever-increasing group of businesses that also measure software companies on their maturity, because they neither can nor will accept IT projects that go off track or miss their deadlines. Even though our customers are active in many different fields, what we do is actually quite narrowly focused. As we see it, our role is to make complicated things simple, to continue development of the solutions that our customers already know and trust, and to do everything a little better – and to constantly challenge existing work processes and technologies. Everything we do at Systematic is expressed in our four brand values: Simplicity. Trust. Performance. Forward-thinking. In this magazine, we expand on these themes and present examples of how Systematic’s 419 skilled employees in Denmark, the United Kingdom, the United States and Finland go the extra mile every day to live up to our high level of ambition. HEALTHCARE Columna, the clinical information system from Systematic, allows doctors, nurses and medical ­secretaries to perform the vast majority of their ­clinical, planning and patient administration registrations in a single solution. DEFENCE Systematic supplies reliable and user-friendly IT solutions for the defence industry that provide a clear overview of the situation and ensure that different military systems can exchange electronic information securely and unambiguously. Systematic’s 419 employees in Denmark, the United ­Kingdom, the United States and Finland know that their efforts make a difference. Every single day, thousands of people depend on the work they do. These people use IT solutions from Systematic to make decisions – often in demanding or even life-threatening situations. Systematic has more than 25 years of experience in efficient project ­management, which is often the key to the success­ ful outcome of a project. This is backed by solid experience in the development and integration of complex IT systems. Over the years, in addition to these purely professional skills, the company has also built up a deep pool of insight into the defence sector and the healthcare industry. Against this background, we have developed a range of standard products for both these fields, which are explained in more detail on pages 18-19. INTELLIGENCE AND ­NATIONAL SECURITY Police forces and intelligence services use Systematic solutions and services in emergency response setups and surveillance systems, and to protect critical infrastructure. INTEGRATION SERVICES Systematic is an expert in classic system integration solutions and in developing fully customised solutions in close collaboration with individual customers. Systematic is the largest privately owned software and ­system provider in Denmark. Systematic’s head office is located in ­Aarhus, where the majority of our software ­development work takes place, and the company also has an office in Copenhagen. In the United Kingdom, Systematic has offices in Camberley and Sleaford. Our Camberley office is involved in numerous British projects and plays an active role in sales and services in many parts of the world, while the Sleaford office is the skills centre for the Group’s activities in the field of Electronic Warfare. The American office in Fairfax, close to Washington, ­handles ­s ales and development assignments in North and South America. The Systematic office in Finland takes care of the company’s business in Finland and the Baltic States. It is also the skills centre for vehicle-based defence systems. If you have never participated in an IT project, you may find it hard to understand why such projects so often crash and burn. Even though Denmark is an international leader in applying new technology in the public sector, Danish state-run IT projects are no more successful than their counterparts in many other c­ ountries. According to a report prepared for the Danish government (“Professionalisation of the work on state-run IT projects”, 2010), the average budget overrun on major state IT projects that run into difficulties is 40 per cent, while the average time-related overrun amounts to 75 per cent. The same report presents constructive suggestions for how to prevent overruns in time and expenditure. In this context, ­professionalisation, project management, risk management ­ and close dialogue with suppliers are top of the list. received certification to Level 5 – the highest level – ­according to CMMI (Capability Maturity Model Integration), the internationally recognised maturity model. Systematic is also certified in accordance with the ISO 9001:2000 standard and the military AQAP 2110 and 150 standards. Constructive working relationships Reliable project management is one thing – the approach to working relationships with customers is quite another. Systematic has always focused on maintaining a pragmatic and constructive dialogue with its customers. “The most important factor in the working relationship with our customers is to maintain constant focus on meeting each ­customer’s specific business needs. If the world changes, we change with it – and we work closely with the customer to come up with the ideal solution,” explains Flemming Bent Thomsen. A working relationship that creates value “We haven’t spent our money on constant bickering and pushing paper back and forth. We’ve been part of a working relationship in which we kept focused on the goal and concentrated on generating the results we wanted to achieve.” For many years, Systematic has been working with Region Midtjylland (Central Denmark Region) on the development of a modern and fully integrated clinical information system. Systematic’s mission is to deliver IT solutions that make it simpler for users to make crucial decisions in demanding situations. Briefly put: “Simplifying critical decision making”. Such solutions must be able to function 24 hours a day, seven days a week, and they must have the capacity to handle huge amounts of data. They are to provide users with precisely the tools and the overview they need to make the right decisions – regardless of whether the users in question are soldiers, doctors, nurses or civil servants. Simplicity That is why “Simplicity” is a keyword for Systematic. The solutions must be quick, simple and efficient to use. At the same time, they must be able to communicate flawlessly with other systems, and they must have interfaces that users find logical and intuitive. of course. Here, too, the key concept is “simplicity”. Systematic runs a flat and flexible organisation to ensure that we always have the capacity to adapt quickly to changes in the scope and/or nature of our assignments. Other IT companies have also racked up more than 25 years in the business it is quite unusual in this age of mergers and acquisitions that the principal shareholder and the President and CEO have remained unchanged since the company was founded. The accounts for the financial year 2010/2011 show a slight increase in turnover (EUR 50.0 million compared to EUR 48.4 million in the previous year), and a slight increase in operating profits (EUR 5.1 million compared to EUR 4.8 million in 2009/2010). The latter result corresponds to a profit ratio of 10.2 per cent. It is no accident that the company has remained in private hands. “As the company is owned by just the three of us, and we are all c­ ommitted to the well-being of the company, there is no suggestion of thinking in terms of short-term returns,” explains Michael Holm, President and CEO. “We can adopt the long-term view and take risks if we choose to. We can cultivate long-term relationships with our customers and partners, we can focus on quality in all areas, and we can invest in innovation and product d­ evelopment at our own expense – all because we firmly believe that it will pay off in the long run.” Being able to keep the company under private ownership is largely d­ ependent on the financial status of the business. For this very reason, Systematic has always given high priority to healthy finances. The annual accounts for 2010/2011 show that the company has no bank debt and is extremely solvent, with bank deposits totalling EUR 7.9 million at the end of the financial year. At that same time, Systematic’s equity amounted to EUR 14.3 million. The internationally recognised credit assessment company D&B has given Systematic its AAA rating – the highest D&B rating available – and one only achieved by four per cent of all companies. Two business areas in particular – Integration Services and Intelligence & ­National Security – are showing growth with a good influx of new ­customers, especially as regards system solutions and services for the public sector. ­Turnover here has doubled over the past three years, which means that these two business areas now account for about 40 per cent of the company’s total turnover. The Healthcare business area generated turnover 18 percent higher compared to the previous year, while the flow of orders for Defence has been hard hit by the reductions in defence budgets throughout the world, partly because many countries are currently participating in international operations. Systematic is budgeting with a combination of higher turnover and stable earnings for the financial year 2011/2012. Read Systematic’s annual report for more information The Systematic accounts for the ­financial year 2009/2010 reveal a turnover of EUR 50.0 million compared to EUR 48.4 million the previous year. The company’s operating profit totalled EUR 5.1 million compared to EUR 4.8 million in 2008/2009. The company’s profit ratio is 10.2 per cent. For additional information, read the full annual report for the financial year 2010/2011, which you can download from www.systematic.com. Trust is the second of Systematic’s four brand values and describes the “handshake” feeling we want customers to experience when they choose to do business with Systematic. Customer trust in Systematic and our systems and deliveries is nothing short of crucial. Our solutions have put thousands of users all over the world in a position to make the right decisions at the right moments. Trust is something you build up gradually by doing things properly. This is what Systematic has been doing for more than 25 years. We have always focused on high quality, both as regards ­customised system development and our own products. Our employees are some of the most highly skilled software and system engineers in the market. Trust Combined with our Level 5 CMMI-certified processes, this ensures s­ olutions ­ of the highest quality. In addition, we place great emphasis on running in-depth pre-delivery tests that reflect real-life situations as closely as possible. This kind of testing normally accounts for about 12 % of the time devoted to the development assignment. From a purely commercial perspective, we have always abided by the terms of the contracts we have entered into, and we have never given up. This has also applied on the – fortunately few – occasions when the man-hours we had ­allowed for in a fixed-price contract were exceeded by more than an ­acceptable degree because the assignment turned out to be more c­ omplicated than it originally appeared. In such cases we have taken our knocks and ­“chalked them up to experience”. We are committed to ensuring that our customers receive the agreed delivery on time and at the agreed price. in the Danish financial sector. Here, Systematic has helped to simply the flow of paperwork in connection with real estate deals and loan financing, and contributed to the infrastructure – in the form of integration and shared processes, for example – between the numerous financial parties involved. In conjunction with The Danish Ministry of Taxation, ­Systematic has developed a new list system to keep track of goods and services traded across international borders within the EU. The system is linked to the pan-European VIES system (VAT Information Exchange System), which ­co-ordinates data from the different EU member states and plays an important role in the battle to stop VAT fraud. Systematic has also worked closely with the Danish National Labour Market Authority to streamline Jobnet, the biggest job portal in Denmark. The existing system has been simplified so as to reduce maintenance costs and improve user satisfaction. formance accommodate changes to the organisation’s needs. Since 2005, we have been certified to the fifth and highest level of CMMI, and the results speak for themselves. During the past financial year, we delivered 93 per cent of all milestones on time. Our determination to generate better results in all areas is also the driving force behind our decision to mix CMMI with the principles of agile development. While CMMI helps us to apply an exceptional level of discipline – including close monitoring of all development processes – implementing agile processes provides us with impressive flexibility and a remarkable capacity to adapt. We always make sure to involve our ­customers actively in all phases of the development process, for example by giving them the opportunity to adjust their requirements underway if a different setup makes more sense. This means we can ensure that – in close collaboration with our customers – we cover users’ actual needs better and more economically, ensuring that we provide them with ­solutions that can be considered future-proof. SitaWare is in use in Kosovo and Afghanistan. IRIS is used in about 40 countries in all parts of the world. “We have noted that customers are increasingly focusing on price, life cycle costs and risk. Previously, customers from the defence industry and healthcare sector could spend 3–5 years developing their own bespoke systems – with no guarantee that these systems would actually meet their needs. Today, however, they are much more keen on user-friendly solutions that have been thoroughly tested and trialled in real life – and are available for immediate delivery,” explains Andrew Graham. Columna In the field of healthcare IT solutions, Systematic has collated years of experience into a fully integrated clinical information system with the capacity to make big improvements in patient safety and to i­ncrease efficiency in hospitals. “On the basis of a close working relationship with the Central ­Denmark Region, we have developed Columna, an ultra-modern ­clinical information system that allows doctors, nurses and other healthcare personnel to handle the vast majority of their clinical, ­planning and patient administration registrations in a single, integrated product,” says Anders Goul Nielsen, Vice President at Systematic. At the same time, our products serve as catalysts for the i­ncreased ­internationalisation of Systematic’s business operations. Via a ­network of sales partners, which already includes a number of recognised system developers, we can reach even more customers. Our partner strategy likewise underpins our growth ambitions and reinforces the flexibility of our business model. Columna has already been fully implemented in more than half the hospitals in Central Denmark Region. The remaining hospitals will follow in the course of 2012. Partners with local knowledge Systematic’s products are based on open platforms, which allow customers to ask their implementation partners to develop the ­solutions even further. t­ echnologies. SitaWare can also be adapted to meet any special requirements that customers may have, and to operate seamlessly with their existing configurations. The SitaWare suite includes products intended for different command levels, from the individual soldier to the uppermost reaches of the chain of command. It matches the requirements from the defence forces of today. These forces are almost always ­involved in multinational operations – from peace-keeping assignments to battle campaigns, and from crisis control to quelling civil unrest. All forces that take part in operations of this kind must be able to exchange data efficiently, irrespective of origin and equipment. The system used must make it possible to exchange orders and reports quickly using complex multinational command structures, and be able to deal with different sets of rules and regulations in different places and at different times. 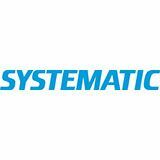 Systematic’s SitaWare ­product suite consists of a range of command and control products targeted to meet the specific needs of different levels within defence organisations. The Systematic IRIS product suite consists of a range of interoperability and ­communication products that have become the de facto standard in NATO defence organisations for handling numerous different military data exchange formats. solutions currently available around the world tend to focus on payment flows connected with the individual patient, and with administrative processes, the Systematic solution takes things to the next level. Columna combines all these functions with a clear focus on clinical work and patient safety. In addition to the numerous journal entries made by healthcare personnel about their patients, the system can also handle bookings for operations and outpatient consultations, documentation of medication, blood test results, discharge letters and the communication of reports to national registers. Columna is scalable with regard to functionality, the fields in which it can be used and the way it can be deployed. At the same time, the product is based on international standards and open architecture, making it ideal for integration into – and interaction with – other systems. Interoperability “Systematic’s specialists have been working with us as we prepare for Exercise FLANDRES, which takes place in June 2011. They have provided expert advice on how British Forces using BCIP might interoperate with the French SICF command and control system. Their in-depth knowledge of interoperability has been critical in our planning in order to reduce risk of failure, and we will be using Systematic’s C2 software during the actual exercise to create a MIP gateway which will allow the UK and French systems to exchange operational data.” Exercise FLANDRES will test the effectiveness of a UK Brigade working with a French Brigade as part of a French Division. The exercise will ­demonstrate the interoperability currently a­ chievable and will undoubtedly inform work leading towards the establishment of a ­Combined Joint ­Expeditionary Force envisaged in the agreement between Prime Minister Cameron and President Sarkozy in ­November 2010. Forward­ –thinking scalability – contribute to ensuring that our products satisfy the ­commercial needs of our customers, both now and in the future. In ­practice, this means that we base our products on ­international ­standards and open architecture that facilitates integration and ­co-­existence with other systems. Likewise, we put a great deal of effort into making our product scaleable so that they can function efficiently in a wider context than the one for which they were originally intended. Research and development projects Forward-thinking is also a consistent theme in the research and development projects that Systematic takes on in conjunction with the business community, educational bodies and other public sector institutions. Systematic is currently working on a number of such projects, including one centred on developing a special IT tool to assist medical staff in treating blood clots, and one linked with the development of Galileo – the European GPS navigation system. Systematic is known for its ability to deliver high-quality, i­nnovative IT solutions on time. If anyone thinks this is something the company has accomplished by our staff just sitting in front of c­ omputer screens, munching pizza and slurping Coke, they are sorely m ­ istaken. Many of Systematic’s customer relationships have proved to be of a long-term nature, which has given the company a detailed insight into these customers’ business procedures, needs and ways of thinking. “We believe the best ideas are developed in cooperation with our customers, and this requires that our staff can understand each ­individual customer’s business as well as being able to ­communicate in terms that the customer understands,” e­ xplains Janne Hallum, Systematic’s director for People, Culture & ­Communication. Systematic has built up and acquired substantial knowledge in the defence and healthcare industries in particular, and has even hired people with this kind of background to ensure Systematic in-house knowledge in these specialist fields. Seven percent of all our ­employees fall into this category. This is why business know-how and customer focus are high on the Systematic agenda. Directly after new members of staff begin ­working here, they are enrolled in a customer relations course. Both here and at monthly meetings with senior management, there is a focus on business development as well as good c­ ustomer relations. In-house knowledge sharing In addition to understanding customers’ needs, it is imperative that we have competent and knowledgeable employees. As a result, Systematic is not afraid to invest both time and money in our ­ staff – even at the risk of these employees then becoming more ­attractive to other companies. r SYSTEMATIC for 12 years. their average age is 37 YEARS. “We have a motto that says ‘it is better to educate people and risk they leave than do nothing and they stay,’” ­explains Janne Hallum. As of October 2011, Systematic software ­developers had a total of 584 individual certifications. Of these, the b­ iggest portion lies in heavyweight ­technological ­certifications for Microsoft, Java and Oracle or c­ ertification within project leadership such as M ­ anagement ­Professional, Prince 2 and Scrum. Systematic’s approach to competency development ­includes in-house knowledge-sharing networks that ­support the knowledge-sharing process, build new ­knowledge based on roles, technologies or p­ rocesses. They include an architect network, a network for ­programming languages and a test network. with physical and psychological trauma. We have a duty to help them – both as a nation and as a responsible company, b­ ecause this is not a task the Danish defence forces can or should tackle alone. This task should be accomplished by s­ ociety and business pulling together,” says Michael Holm. Last but not least, we have established jobs within S­ ystematic that are earmarked for defence forces p­ ersonnel who have been wounded. These military personnel will work on testing the advanced Battle Management System software that ­Systematic produces for use in both HQ s­ et-ups and on the front line. The organisations that Systematic supports include the independent Danish Soldiers’ Grant Foundation, which helps soldiers who have suffered physical or psychological trauma after an international tour of duty as well as helping b­ ereaved relatives of those who sadly lost their lives. S­ ystematic ­provides the Foundation’s administration with office space in the company’s Copenhagen office, free of charge. “These soldiers have practical knowledge from the field and from battle, and we can put this to good use in our business. In return, we can provide them with training as IT testers – a skill that can be used throughout the IT industry. We hope this means we can play a part of getting wounded veterans back into the job market,” says Michael Holm. Systematic is also a regular contributor to the association SSOP – Støt Soldater & Pårørende (Support ­Soldiers and Relatives), and we were honoured to host a lunch after the annual Anders Lassen Foundation award of grants p­ resented to soldiers.